The Angry Gnome Welcomes One and ALL to Oma Linda’s Wizard of Oz party!!! In honor of this Special, Annual Event, the Angry Gnome and his friends decided to make an Ozzie Wand for a Give Away!! They began with some Oz Scrapbook paper they’ve been hoarding for just this Occasion! They also had a glass bowl shape and a wood piece and a dowel. Everything was at their disposal so they began their work! Once this was painted, two more Gnomes drilled the hole for the Wand handle. Hmmmmmm....there was a bit of a delay, due to a bottle of wine...but work was eventually resumed and the hole successfully drilled! Some Extras were being chosen...Stars were very important!!! 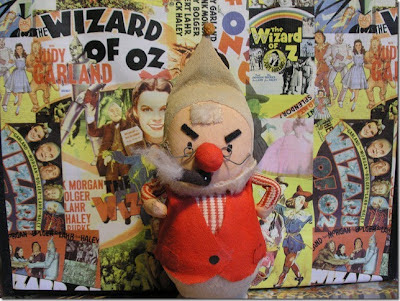 And the Angry Gnome, himself, worked on the famous OZ Symbol!!!! Next came the OZ figures on the green base and Glitter!!! One of the Gnomes spilled quite a bit of glitter but managed to also get some around the Witch figure, where it was needed! After working ALL DAY, the Angry Gnome and friends had created a wonderful, BIG, Magical Witch of the West OZ WAND!!!! And here it is!!!! 1) What is the Tin Woodman’s REAL NAME? 3) Which TWO Characters are the only TWO allowed to practice MAGIC in the land of Oz?? Answer these 4 Questions correctly and your name will be put in a Drawing. The Drawing will take place July 20th, the DAY AFTER the OZ PARTY!!! And there will also be a Second Drawing for a Wonderful OZ Shopping Bag, as well, on July 20th. having to do with the OZ PARTY!!! Your name will then be put into a Drawing and the Winner chosen July 20th!! SO, you have an OZportunity to win the Oz Wand OR the Oz Bag on July 20th!!! GOOD LUCK and Remember, There’s No Place Like Home!!! Alas, I cannot see your pictures, Angry Gnome. These most be one of those anger-induced spontaneous combustion cases. The Angry Gnome is gone! The angry Gnome isn't angry about me, cuz i can see all the funny, lovely, hilarious pictures :-) You put a lot of time and effort in the Oz party Linda! Very well done my dearest! Now that the photos are here, I can see that the Gnomes made one witchin' bitchin' magic wand! Alas, I do not know a single answer to the questions, LOL! I love these little guys! Especially the really, really angry Gnome! He looks to be a real task master ... but they have created a truly Oz-some "Magical Witch of the West OZ WAND! 1. "Tin Man"! or could it be Nick Chopper aka Jack Haley? 2. I do believe his name is Hank? 3. Glinda and the Wicked Witch? 4. Toto!? or perhaps one of the Munchkins??? Hmmmm, it seems I have answered all the questions with a question? Well, off to visit more "Celebrate Oz" Partay Blogs! Happy Day! Happy return to Oz Celebration! Nick Chopper, Hank, Glinda And The Wizard and THE LION!!! Wow! No wonder they disappeared earlier, they were working their hearts off. And what wonderful results! 2. “You’ll protect me, Hank dear, won’t you?” she cried helplessly, and the mule said “Hee-haw!” again, in tones that meant a promise.” *cough, cough* sorry, I was in character. His name is Hank. 3. The Wizard of Oz and Glinda the Good, but I’ve sent numerous appeals! 4. I’m not sure who this lovely if frowny gent will like, but I’m thinking The Patchwork Girl. Yes, I think he’ll like Scraps. OH THANK-YOU ALL FOR YOUR WONDERFUL COMMENTS!!! You have made the Gnomes SO HAPPY they are enjoying, YET, ANOTHER Bottle of Wine!!!! Before they all PASSED out, they did happen to comment that ONE OF YOU has gotten ALL THE ANSWERS CORRECT!!! The Angry Gnome would still like to have a Drawing so he will NOT pick Winners till late tomorrow evening (July 20th) Please also go to HIS Facebook and see the second Prize- an Ozzie Shopping bag!!! One more Hint about his favorite Oz Character- it is a Villain, NOT seen in the Movie, "The Wizard of Oz". YOu are ALL AWESOME!!!! MADDYROSE!!! The Angry Gnome has Reluctantly decided That YOU!!! YOU, MY DEAR, are the WINNER of the WIZARD OF OZ WAND!!!!! He was hoping to STUMP EVERYONE and almost CHEATED when he saw your answer! He wanted to CHANGE HIS FAVORITE CHARACTER. BUT I PUlled his beard till he said, "UNCLE!!! I MEAN, MADDYROSE!!!!!" SO!!! CONGRATULATIONS!!!!!!! Please leave your address in a Message to The Angry Gnome..or with Oma Linda (I can get it from her) and we'll send your WAND out MONDAY!!!!! I'm so excited I can't think straight and all of this jumping up and down and the cart wheels is making me hyperventilate and wheeze! I'm thrilled beyond words so I'll just say, I LOVE BEING A WINNER!!! HIP-HIP-HORRAY!!!! Thank you for not renigging Angry Gnome. Great job on the wand, Oma Linda! I didn't know the answers, but I really enjoyed reading this post. MAGIC LOVE CROW!!! YOU DID WIN the Oz Shopping BAG!!!!! CONGRATULATIONS!!!!! Now I just need your address over at The Angry Gnome..or I will get it from our Oma Linda!! HIP HIP HOORAY!!!!! !OZZIE CHEERS TO YOU!!!!!! Those questions were stumpers but I was so excited that I COULD see all the wonderful pictures I did not care that I was too late to enter. I discover your blog right now through google search!! !